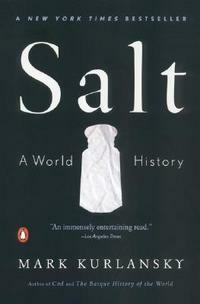 Which brings me to an old favorite: Salt: A World History by Mark Kurlansky. First published about ten years ago, it’s one of those “little big” books, a book that takes a seemingly narrow topic and illustrates a wider window on the world and its history. From trivial tidbits (the word salary is from the Latin sal for salt) to exhaustive chapters (like the one on the gabelle—the French tax on salt), Kurlansky keeps things moving throughout history, always using salt as a narrative thread.